Is It Due for a Repeat of the Powerful 1868 Earthquake? On October 21, 1868, a magnitude 6.8 earthquake struck the San Francisco Bay area. Although the region was sparsely populated, the quake on the Hayward Fault was one of the most destructive in California’s history. The 150th anniversary of the 1868 earthquake, and all historical earthquake anniversaries, are opportunities to remind people that we live in earthquake country and we should all be prepared for the next big quake. U.S. Geological Survey (USGS) studies show that similar Hayward Fault quakes have repeatedly jolted the region in the past and that the fault may be ready to produce another magnitude 6.8 to 7.0 earthquake. Such an earthquake could unexpectedly change people’s lives and impact the Bay Area’s infrastructure and economy, but updated building codes and retrofits, as well as planning, community training, and preparedness, will help reduce the effects of a future Hayward Fault earthquake. In the early morning of October 21, 1868, seismic waves from a powerful earthquake raced through the fog-shrouded San Francisco Bay area. Frightened people ran out of their homes, and cattle and even fire-engine horses panicked and bolted. Strong shaking lasted more than 40 seconds, devastating several East Bay towns. Brick buildings, walls, and chimneys were also shaken down in Oakland, San Francisco, Santa Rosa, and San Jose, and there was serious damage in Napa and Hollister. Numerous witnesses reported seeing the ground move in waves. Shaking was felt as far away as Nevada, and aftershocks rattled the Bay Area for weeks. Even though the region was only sparsely populated at the time, the 1868 quake killed about 30 people and caused great property damage. It still ranks as one of the most destructive earthquakes in California’s history, but this is not the end of the story. The Hayward Fault will rupture violently again, and perhaps soon. The 1868 earthquake on the Hayward Fault capped a decade-long sequence of seven increasingly strong quakes in the Bay Area. Ground cracking caused by this earthquake was traced for 20 miles along the Hayward Fault, from Warm Springs in Fremont north to San Leandro. Historical land-survey data suggest that the fault broke as far north as Berkeley, with an average horizontal offset of about 6 feet (2 meters). Shaking from the 1868 quake was the strongest that the new towns and growing cities of the Bay Area had ever experienced. Until it was eclipsed by the great 1906 earthquake, the 1868 earthquake was known as the “great San Francisco quake.” The area of strongest shaking covered about 1,000 square miles. In San Francisco, the largest city on the west coast with a population of 150,000, five people were killed and property losses were significant. Many brick walls, cornices, and other heavy architectural elements of buildings in the city fell, and the U.S. Custom House and several other structures built on land reclaimed from the former Yerba Buena Cove (today’s Financial District) sustained severe damage. However, as in 1906, well-constructed buildings on firm ground sustained much less damage. Towns in the East Bay suffered the most severe damage. Almost every building in Hayward, then a town with about 500 residents, was wrecked or severely damaged—few places have paid so dearly to have a fault named after them. At San Leandro, with a population of about 400, the second floor of the Alameda County Courthouse collapsed, and many other buildings were destroyed. At Mission San Jose, in southern Fremont, the adobe church built in 1809 and other mission buildings were heavily damaged. Oakland, a town of about 12,000 and mainly wood-frame buildings, was much less heavily damaged than San Leandro and Hayward. San Jose, a town of about 9,000 that lies several miles south and west of the fault trace, had few wrecked buildings but many fallen chimneys. Because seismographs had not yet been invented, there are no recordings of the 1868 earthquake. Much of what we know about the 1868 quake is documented in a chapter of an important report on the 1906 San Francisco earthquake, which was published in 1908. The chapter reviewed the descriptions of surface faulting, collected damage and felt reports, and interviewed survivors of the earthquake. USGS and other scientists have used the 1908 report, as well as historical newspaper accounts, photographs, pioneer diaries, and letters, to understand the shaking effects and gauge the size of the 1868 earthquake. To estimate the shaking intensity, it is necessary to consider the construction of the damaged buildings, that is, whether they were adobe, brick, or wood. Combining these intensity estimates with current knowledge of earthquake effects and geology allows researchers to create a “ShakeMap” that depicts the inferred intensity of shaking throughout the region in 1868 and can also be used to predict damage to modern buildings. The map shows that shaking was strongest in Hayward, Fremont, and San Leandro, and weaker but damaging in Oakland, San Francisco, and San Jose. Scientists estimate that the magnitude of the 1868 quake was 6.8. Comparing the ShakeMaps from the 1868 Hayward and the 1989 (magnitude 6.9) Loma Prieta earthquakes shows that a repeat of the 1868 quake would produce much higher levels of shaking and damage in the East Bay than the 1989 quake. After the 1868 quake, and a previous one in 1865, damaged San Francisco, engineers worked to strengthen buildings throughout the Bay Area. They retrofit masonry buildings with iron tie-rods and anchors between floors and walls, and they designed and implemented systems to make new buildings more resistant to shaking. Innovations included a stronger course of brick-laying, incorporating iron binders into brick walls, and interior iron framing. But the most significant improvement in shaking resistance was the advent of steel-frame buildings in 1885. These measures combined to ensure that buildings built in San Francisco between 1868 and 1906 survived the powerful shaking of the 1906 San Francisco quake, with the exception of the San Francisco City Hall. Other important engineering lessons from the 1868 earthquake, though actively discussed at the time, were not heeded. The hazard of building on landfill in San Francisco Bay (called “made land” at the time) and the admonition to “build no more cornices” were largely forgotten by the time of the 1906 quake. Is the Hayward Fault the Nation’s Most Dangerous Fault? in the United States—in 1868 there were only 24,000 residents living in Alameda County; now there are more than 2.4 million people. Hundreds of homes and other structures are built along the fault trace, and mass transit corridors, major freeways, and many roadways cross it at numerous locations. Critical regional gas and water pipelines and electrical transmission lines cross the fault. Ongoing slip and aftershocks along the Hayward Fault may last for months, further damaging buildings and infrastructure that straddle the fault. A second factor making the Hayward Fault so dangerous is that its most recent damaging earthquake was more than 150 years ago. USGS scientists have found evidence for 12 quakes on the southern Hayward Fault during the past 1,900 years. Notably, the last six quakes (in 1134, 1317, 1475, 1629, 1725, and 1868) occurred at intervals of 95 to 183 years, with an average interval of about 150 years. The 150th anniversary of the 1868 quake is in 2018; scientists are convinced that the Hayward Fault has reached the point where a powerful, damaging earthquake can be expected at any time. The 1868 Hayward Fault earthquake is a reminder of the tremendous power that lurks beneath the Earth’s surface in the San Francisco Bay region. The population at greatest risk from a Hayward Fault earthquake is 100 times greater than in 1868. The urban infrastructure in the Bay Area has been tested only by the relatively remote, 1989 magnitude 6.9 Loma Prieta earthquake, and the smaller 2014 magnitude 6.0 South Napa earthquake. USGS earthquake science tells us that it’s now urgent to prepare for the next magnitude 7 quake on the Hayward Fault. Preparing now can significantly reduce loss of life and property from that coming quake. As demonstrated by the aftermath of Hurricanes Katrina, Sandy, and Maria, recovery from catastrophic events can take years. Damage to infrastructure, such as transportation and utilities, and other long-term economic effects could substantially increase the losses. Recently, the USGS and its partners developed the “HayWired” scenario as a tool to enable further actions that can change the outcome when the next major earthquake strikes. 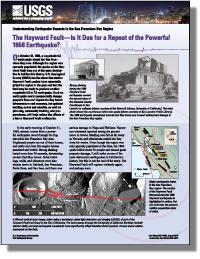 The HayWired scenario is a hypothetical, but scientifically plausible story of an earthquake and its aftermath that happens in the Haward Fault. By illuminating the likely impacts to the present-day built environment, well-constructed scenarios can and have spurred officials and citizens to take steps that change the outcomes the scenario describes, whether used to guide more realistic response and recovery exercises or to launch mitigation measures that will reduce future risk. In addition to creating scenarios, regular practice drills by whole communities are essential. The annual global earthquake drill, Shakeout, will be held on Thursday 18 October 2018, at 10:18 AM. Over 8.7 million Californians and nearly 54 million globally are already planning to participate. It’s a perfect time to practice Drop, Cover, and Hold On, to check your emergency kit, and to test your earthquake response plans. We dedicate this story to the memory of USGS seismologist John (Jack) Boatwright, who was passionate about making the San Francisco Bay Area more earthquake resilient, and who died shortly before the 150th anniversary of the destructive 1868 Hayward Earthquake. Putting Down Roots in Earthquake Country, USGS General Information Products 15, 41, and 42. Brocher, T.M., Boatwright, J., Lienkaemper, J.J., Prentice, C.S., Schwartz, D.P., and Bundock, H.P., 2018, The Hayward Fault—Is it due for a repeat of the powerful 1868 earthquake? : U.S. Geological Survey Fact Sheet 2018–3052, 4 p., https://doi.org/10.3133/fs20183052.